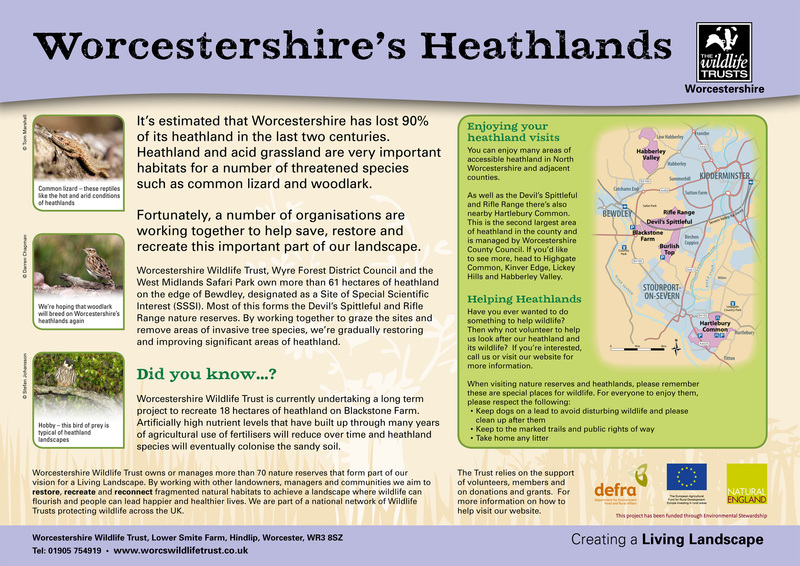 This impressive heathland is one of the largest areas of the habitat left in Worcestershire. It’s estimated that we’ve lost approximately 90% of heathland in the county over the last 200 years. Visitors to the 60 hectare reserve of Devil’s Spittleful and Rifle Range will walk through a mosaic of habitats that thrive on acid soil; open areas are dominated by bell heather and acid grassland is dominated by wavy hair grass. Gorse and broom make areas of the reserve quite scrubby and other parts have developed into woodland. We’re removing some of these areas to allow the heathland to improve and expand. Together with grazing this ensures there is a range of ages of heathland plants – great for providing a diverse habitat for wildlife. The heather is at its best in late July and August. There are, however, many other plants to discover at other times of year. Heath dog violet, early forget-me-not and small cudweed are in flower from June to September. Grey hair grass and buck’s-horn plantain are also found on the reserve; they’re normally associated with coastal regions. The combination of heathland, grassland, scrub and trees is perfect for invertebrates. 20 species of butterflies can be spotted – from pearl-bordered and silver-washed fritillaries to purple hairstreaks. More than 160 species of moth have also been recorded here included barred tooth striped, grass wave, orange underwing and fox moth. Already well known for the Red Data Book listed wasp and mining bees found here, more recently 2 new species for the reserve are nationally and locally important: the black mining bee Andrena nigrospina and the hornet robber fly Asilus crabroniformis. The reserve is also great for fungi, with over 140 species including pine wood mushroom, honey fungus, oyster mushroom and liberty cap. While we’re hoping our improvements will eventually attract birds like nightjar and woodlark, there are plenty of birds to be found here at the moment. When you visit keep a look out for redstart, tree pipit, cuckoo, wood warbler, lesser whitethroat, green woodpecker and sparrow hawk. The reserve name centres around the rocky sandstone knoll crowned with Scots pine known as the Devil’s Spittleful or Spadefull. A ‘spit’ was a spade’s depth and the area is thought to have got its name from a digging Diablo. The cave beneath the rock has become unstable and is now no longer safe to view. In 2007 the Trust acquired three fields from adjacent Blackstone Farm. Our long term aim is to restore the fields to heathland. As heath-loving plants thrive in relatively poor quality sandy soil, we’re beginning the restoration by reducing the nutrient levels in the soil. The Rifle Range is owned and managed by Wyre Forest District Council. 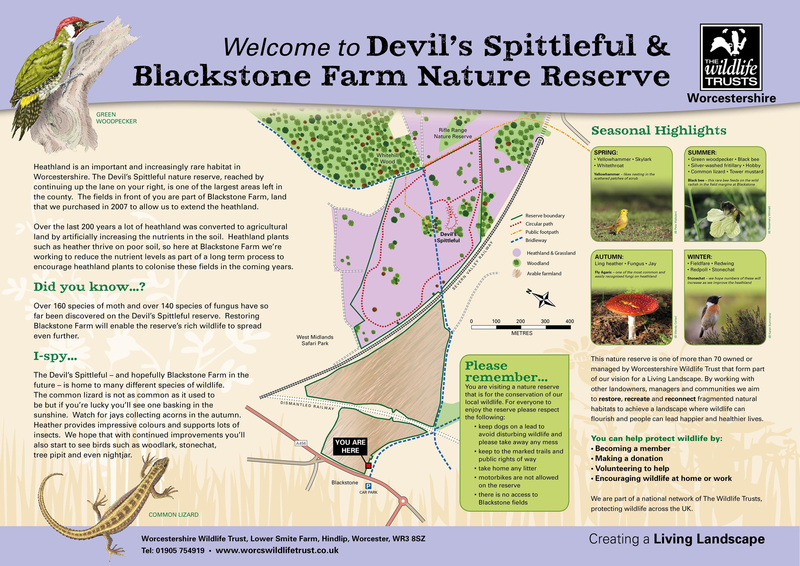 Why is the Devil’s Spittleful and Blackstone Farm fields a Flagship Reserve? This is an important heathland site with extensive restoration work planned as well as heathland creation work which was started on the Blackstone Fields in 2009. This is an ideal site where we can share our experiences of the long term management of heathland and its creation and management of associated nationally important flora and invertebrates. The reserves fall within the Wyre Forest Heathlands identified as one seven priorities in Worcestershire for its Living Landscapes approach. Dusk to dawn on The Devil's Spittleful. No access to Blackstone Farm Fields. Please keep to paths an abide by signs during the breeding season. Park at entrance to Sandy Lane (SO807759 next to West Mids Safari Park) or on the County Council car park at Blackstone on the A456 (please do not drive up the lane opposite); the reserve is a 5-10min walk along Sandy Lane and under the railway bridge. The reserve is a 5-10min walk from both these locations.